For a local market with over 30 companies, 400+ direct jobs, $56 million in direct economic activity and $108 million in total economic activity annually being generated by algal development, it begs the question: why has San Diego seemingly become the Mecca of Algae Production? 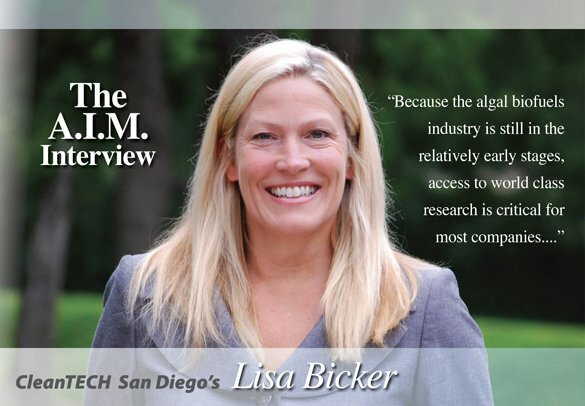 To get an answer, we went to Lisa Bicker, President and CEO of CleanTECH San Diego, a networking and business resources non-profit organized by San Diego’s Mayor Jerry Sanders in 2007 to put a focus on his city’s green economy initiatives. Lisa is a lawyer by trade, and was the first president hired by CleanTECH San Diego. Prior to this position she lived in San Francisco, running the California Clean Energy Fund (CalCEF), a private, non-profit evergreen fund that was created in order to support investments in clean energy technology. “If you talk to Sapphire Energy,” she continues, “they’ve indicated that they relocated their business from the Bay Area to San Diego simply to be in the ecosystem around San Diego’s research facilities. You have such internationally acclaimed institutions here as the Scripps Research Center, the Scripps Institution of Oceanography, and SD-CAB (San Diego Center for Algal Biotechnology—a consortium of research and university professionals at UC San Diego and San Diego State), which is specifically focused on biofuels and private sector funders. There are over 50 research institutes here in San Diego, so it provides a wonderfully fertile ground for growing new game changer technologies like algal biofuels. 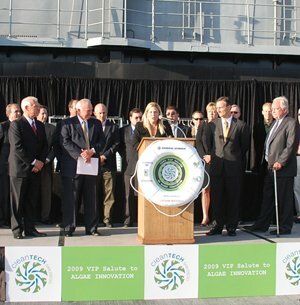 Lisa Bicker introducing Mayor Sanders (left of Lisa Bicker) aboard the USS Midway at Oct 2009 “VIP Salute to Algae Innovation” event. Also featured: San Diego County Supervisor Ron Roberts (first row, far left), Jason Pyle, CEO Sapphire Energy (next to Lisa Bicker), Bill Davison, Vice President Advanced Process Systems Division, General Atomic (first row, far right). So how did CleanTECH San Diego come about? It was created in 2007 by Mayor Sanders, along with a number of other regional leaders. They started to see a lot of interest in clean technology and a study was performed to see how many businesses existed in the region. It showed that there were close to 200 businesses in 2007 in the cleantech sector, as well as a lot of growth. So the thought emerged that there was a need for a new non-profit organization whose function would be to put San Diego in a leadership position as the state and the nation transitions to a cleantech economy. What was the charter for CleanTECH San Diego? We have an economic development focus. We’re a public-private partnership. Our membership is comprised of universities, local governments and, most importantly, the private sector. We represent investment capital, other financial institutions, large industry players who are in the green space like Hewlett Packard, Kyocera, and General Atomics. We also represent small businesses that are looking for their first round of funding or looking to acquire new strategic partnerships to expand their access to the market. So, at our essence, we are a market connectivity organization. We serve our role by bringing together policy makers, private capital, the innovation community and the research institutes around a common agenda. All those diverse interests are pointed toward the single objective of San Diego’s cleantech economy. 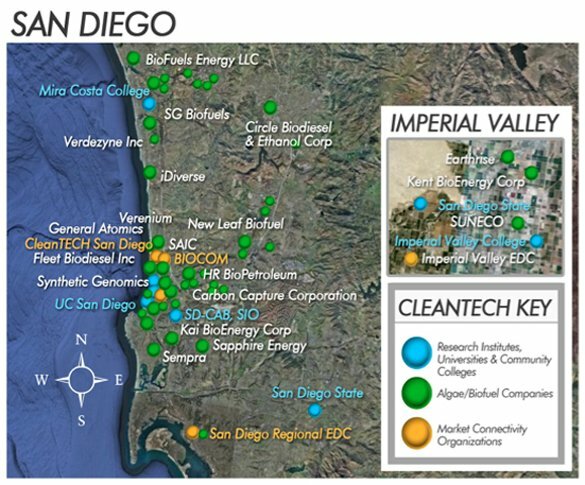 How do algae businesses fit in with the overall cleantech companies in the organization and how has that changed in the three years since CleanTECH San Diego was formed? One of the most important things that we do is track the growth of our cleantech business cluster here in the greater San Diego region. CleanTECH San Diego recently won an award as the seventh best cluster organization in the world, and that’s because the Better World Capital Group in the Bay Area made that distinction based on our work to track our cluster. We have 728 cleantech companies in the greater San Diego region, and we don’t just track the number, we catalog them and we track them very carefully. One thing that we noticed as we looked at trends was the significant growth of the algal biofuels sector. Two years ago we noticed a significant uptick in company formation and company relocation to the San Diego region. So we started to pay more attention to that sector. We also noticed that some of our large members, like General Atomics and Sempra Energy, were starting to care about algae. So we started a project working with the San Diego Economic Development Corporation and our sister organization, BioCom. There’s a tremendous crossover opportunity between cleantech and biotech companies, and both our organizations realized that. Together, we’ve reached out in our community and we support the small and large businesses through a special initiative where we bring these businesses together and engage them with local and state, and in many cases federal decision makers so that we can start to 1. create an ecosystem around the biofuel sector in our region by getting folks in a room and letting them do business and 2. identify some of the specific barriers as we build this new industry, so that we can address them early on and help knock those barriers down, and 3. focus very clearly on the opportunities that are specific to the San Diego region. The Mayor of San Diego has been a particularly strong supporter of this sector, and has created a special team in the mayor’s office to help look at business development issues around the biofuels sector. Is this a unique situation to San Diego, or do you think it’s a model for other cities? I think that the opportunity in clean technology is so large, and the issues so complex, and the time line in many ways is so short, in terms of seeing an economic recovery, ensuring our energy security and meeting our environmental objectives. Because of those factors, I think new models, where you actually create and support and proactively put the public sector and the private sector in the same room together and identify a common path—I think those new models are likely to be the most effective. I don’t think it is unique to San Diego, but I think San Diego has a significant head start and I think that because of the strong track record in collaboration here, and the huge success of the biotech sector, and BioCom in particular, it puts San Diego and the cleantech effort in a very strong position to succeed, which is why in many ways we are ahead, some would say, of other organizations. There are other trade groups focused on cleantech, so the concept itself is not unique. The approach, in terms of making collaborations job one and focusing specifically on creating large economic engines and frankly having the assets that San Diego has, as well as the playbook that we took from other trade groups, are huge competitive advantages for us. What are the most serious issues being discussed collectively by the algae companies in San Diego? There are a number of issues. Financing is always critical. Creating a level playing field at the federal and state level, with regard to clean fuel issues and algae and biofuels as a source is an issue. Local, state and federal incentives for encouraging manufacturing and commercialization are issues. San Diego and California are notorious for an innovation culture, but you have a tendency to see manufacturing facilities developed elsewhere. So we need to do a better job at not just supporting innovation in California, but making sure that we are proactively supporting clean manufacturing in California. And as we move to commercialization and the production cycle, that’s going to be important to the algae industry. We also have a challenge in work force readiness and development. While the focus right now is on research and discovery and the early stage of translation of that research and discovery, very soon—in the next 24 months—there is going to be a tremendous focus on commercialization and we are truly going to tap the potential of this industry. One critical factor is the need to have a skilled and ready workforce. The State of California recognizes this and recently issued something called a Challenge Grant, and they opened it up to all green industries. CleanTECH San Diego, together with BioCom, the EDC, SD-CAB (San Diego Center for Algae Biotechnology) and the Workforce Partnership recently applied for the Challenge Grant, to put in place a workforce training and development program that would be industry-led and industry-driven around biofuels. We won a $4 million grant and we’re very pleased and excited about it. It’s called the Edge Initiative (Educating and Developing Workers for the Green Economy) and we have started implementing that initiative. Now our goal is to ensure that we have a ready workforce in 24-48 months with skills and training and that will be ready to accept the jobs that we know are coming in this sector. That’s a great example of how San Diego collaborates and how we focus on economic development and green job creation. And we did it on an issue where we have some leadership, which is biofuels. What would you most like to see the organization accomplish in the coming years? Our long-term vision is to create significant economic engines around critical issues facing our region, our state and our country. We want to solve some of the world’s most pressing problems and create economic development at the same time. You’re going to see that in biofuels, and I think you’re going to see that in our leadership position around solar energy, and increasingly I think you’re going to see that in the convergence of several sectors like the convergence of biotech and cleant, and the convergence of information technology and solar technology. San Diego is uniquely positioned to really contribute in biofuels, solar power, the smart grid space and in energy storage applications. We don’t lead in everything, but there’s a couple of critical sectors in the cleantech space where we have a significant head start, and you are going to see both environmental and economic value driven from this region.